With a stay at Sol Plaza Sleep in Salvador (Armacao), you'll be within a 15-minute drive of Itapua Beach and Iguatemi Shopping Mall. This beach hotel is 6.9 mi (11 km) from Farol da Barra Beach and 8.3 mi (13.4 km) from Agricultural Exhibition Park of Salvador. This hotel is located just 200m from the beautiful beach of Itapuã, one of the most famous beaches in the city. It is ideally located near to the Pólo Petroquímico complex and Aratu industrial park. Salvador's state administrative centre can be found 10 km away. The hotel has easy access to the airport which is only 5 km away. The fully air-conditioned hotel is ideal for those travelling for pleasure or business. Facilities include: 24-hour reception, lift access, a restaurant, Internet access (fees apply), a TV room, a games room and a garage. The hotel also has 2 conference rooms. All rooms are comfortable and are fitted with an en suite bathroom. Rooms include: individually adjustable air conditioning, a direct dial telephone, TV, radio, Internet access, music facilities, a minibar and a safe. In the hotel area there is a swimming pool and garden. With a stay at Hotel Sol Bahia Sleep in Salvador (Pituacu), you'll be within a 15-minute drive of Itapua Beach and Agricultural Exhibition Park of Salvador. 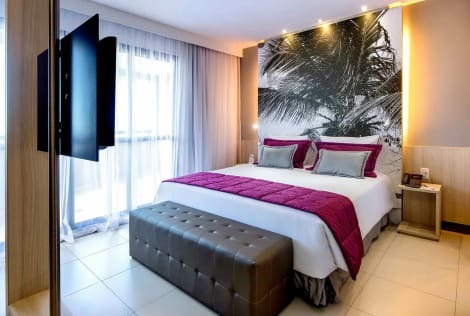 This family-friendly hotel is 6.7 mi (10.8 km) from Flamengo Beach and 7 mi (11.3 km) from Iguatemi Shopping Mall. Aparthotel Adagio Salvador boasts apartments equipped with a kitchen, fridge, microwave, sink and induction hob to make you feel at home during your business or leisure trip. 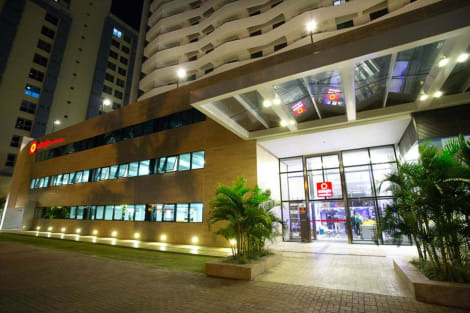 This Salvador hotel is located opposite the Salvador Shopping mall and close to the Shopping Sumaré and Shopping da Bahia malls, the Sesc Theater and business centers. The beaches and sights of Salvador, such as Modelo Market, the Lacerda Elevator, Pelourinho, the Barra Lighthouse and the Fonte Nova Arena are easily reached by car. With a stay at Hotel Bahia Do Sol, you'll be centrally located in Salvador, within a 10-minute drive of Porto da Barra Beach and Farol da Barra Beach. 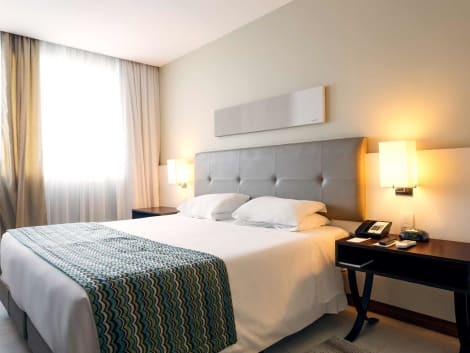 This hotel is 2.5 mi (4 km) from Mercado Modelo and 6 mi (9.6 km) from Iguatemi Shopping Mall. lastminute.com has a fantastic range of hotels in Salvador, with everything from cheap hotels to luxurious five star accommodation available. We like to live up to our last minute name so remember you can book any one of our excellent Salvador hotels up until midnight and stay the same night.